It's Super Bowl Sunday, which means there are going to be some big surprises ahead. And the first wham-pow moment comes from director Jordan Peel, who has shared an exclusive new look at his horror thriller Us on Reddit. It may only run one minute, but by the time it's over, you may be running from the room screaming. Us is only one short month and a half away from arriving in theaters, and it's perhaps the most anticipated horror movie of 2019. Though an accomplished actor and comedian, this is only the second time in the director's chair for Jordan Peele, after his smash hit success Get Out, which won an Academy Award for best screenplay. Can the guy hit two home runs in a row? There's still much we don't know about Us. The first trailer was delivered as a gift on Christmas day. It is being labeled as a 'social thriller', but it also looks like, on the surface, it's going to be a fun scary time with some deep disturbing laughs. Tim Heidecker, or Tim and Eric, is on board, so it can be all sheer terror. Judging from this latest sneak peek, Us will definitely creep moviegoers out, and it's sure to be quite unpredictable. We haven't ever really seen anything like this in the horror landscape. 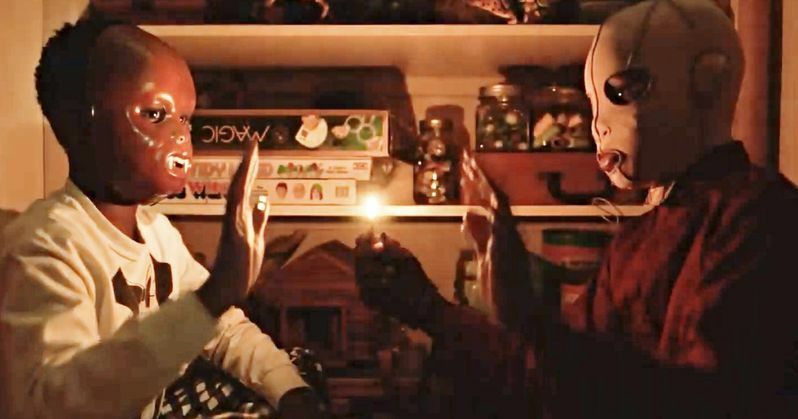 Jordan Peele surprised everyone with the footage on Super Bowl, but he is also using trailer #2 to show off and introduce the new Reddit page for MonkeyPaw Productions, Peele's own personal film banner under which Us was made. This latest preview offers some new details about what we'll see this spring break when Us finally hits the big screen. We're introduced to Lupita Nyong'o' as Adelaide Wilson. She is becoming quite unnerved by some recent "coincidences" that have unmercifully unraveled while on vacation at a beautiful beach house with her immediate family. It appears that something supernatural is happening to her husband and kids. The family is visited by a disturbing team of doppelgängers known as the Tethered. Their origin is currently unknown, but they are frightening in the best sense of the word. We probably won't learn more about these monsters until the premiere. The trailer is jam packed with cringe-inducing imagery, a chilling soundtrack, and a number of surprises that just keep giving. Like Get Out before it, Us will have its world premiere at SXSW. Last year the festival held the premieres for A Quiet Place and Ready Player One, which both went onto be huge successes at the box office. Will Us be another Oscar worthy endeavor? Will it be just a straight up horror ride that evokes screams throughout its runtime? We can't wait to find out.